"There were, in such voyages, incalculable local dangers; as well as that shocking final peril which gibbers unmentionably outside the ordered universe, where no dreams reach; that last amorphous blight of nethermost confusion which blasphemes and bubbles at the centre of all infinity…"
Okay, let's just imagine for a moment that world isn't ending. 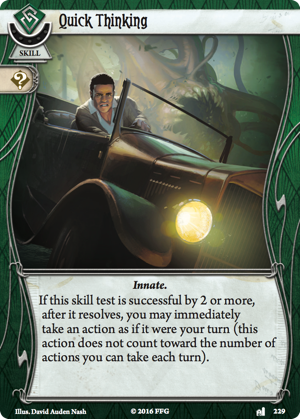 Let's say everything in your investigation is going great… or at least as well as things ever go in Arkham Horror: The Card Game. 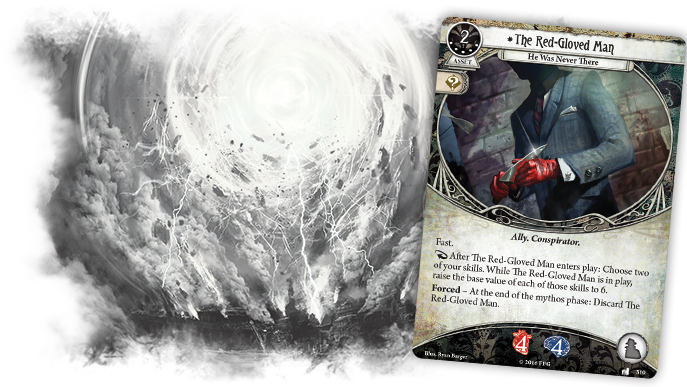 You've uncovered some cultists, you've thwarted some rituals, and there's no immediate threat of world-shattering doom. Indeed, if you get to this point in The Dunwich Legacy, you've put in a lot of good work and certainly deserve a rest. If anyone could possibly fathom what you've done, they should give you a medal. Multiple medals. The bigger problem—the one that's swirling in chaotic fashion all around you—would be the fact that you're not on Earth. In the appropriately titled Lost in Time and Space, you find yourself separated from our reality, desperately looking for your way back. 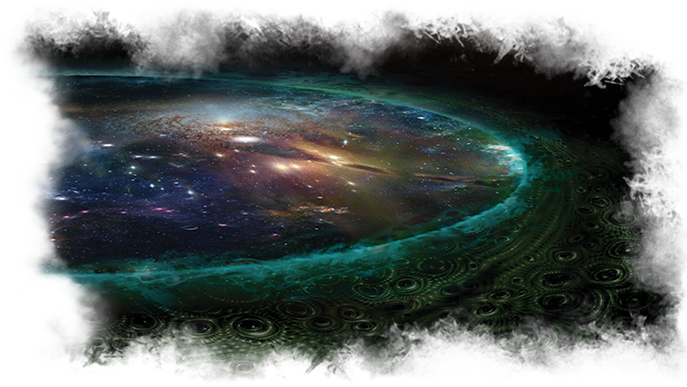 And the ground—or worlds? 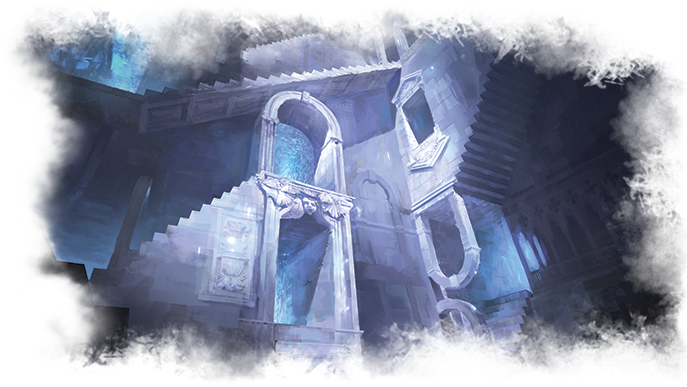 or portals? or realities?—all around you are randomly opening and expanding and closing, tossing you about a tumultuous vortex of swirling possible worlds. Fortunately, you won't have to travel these alien worlds alone. If you choose, you can wander them with the powerful new neutral ally from Lost in Time and Space, The Red-Gloved Man (Lost in Time and Space, 310). A mysterious stranger in a strange land, The Red-Gloved Man won't show you his face or even stick around for more than a turn. 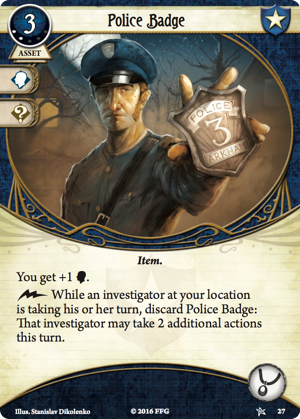 So why would you even play him, much less pay five of your extremely valuable experience points in order to add him to your deck? The answer is because when he shows up, he can make an immediate and powerful impact upon the course of events. When you bring him into play, The Red-Gloved Man allows to choose two of your skills, then raises the chosen skills to a base value of six until he leaves play. In other words, he doesn't just make you good at a couple of skills, he makes you exceptionally good at the two skills you need the most—right now! 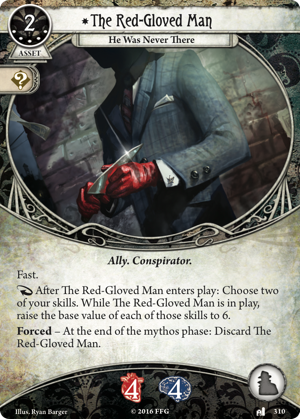 And while you'll likely be sad to see him go at the end of the mythos phase, the fact that The Red-Gloved Man comes with the Fast keyword means you'll at least be able to take advantage of his talents for a full turn's worth of actions. It means that since The Red-Gloved Man can provide any current investigator's best base skill a bump of at least one point—and improves numerous investigators' weakest skills by four points (or more)—he'll be an invaluable companion in those crucial end fights or when your mind is stressed to the point of fragmentation by the impossible angles of the non-Euclidian geometries swirling and bending all around you. 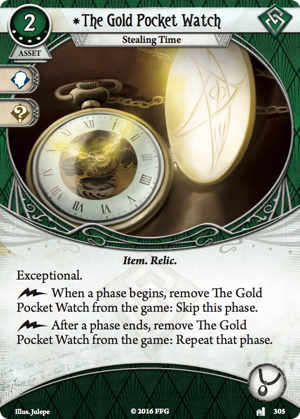 It also means that The Red-Gloved Man is best saved for those turns when everything's coming down to the wire and it's time to fire off the abilities of all your Police Badges (Core Set, 27), Quick Thinking (Undimensioned and Unseen, 229), and The Gold Pocket Watch (Lost in Time and Space, 305) in one last, desperate bid for escape from the shifting realities that surround you. Back to the thin veil of "stability" and "normalcy" in a word that is—mostly—ignorant of the many other worlds and dimensions bordering upon ours, as well all the horrific entities inhabiting them. And if The Red-Gloved Man just happens to be one of those horrors, disguising itself and allying with you for a short period of time, then what is its agenda? And what role do you happen to be playing in the unfathomable plans of someone you thought might have been helping you in yours? Situated amid a shifting and indescribable nexus of infinite realities, how will you find your way back to Arkham? Will you accept the guidance of the mysterious Red-Gloved Man, who just so happens to be stranded in the same space between worlds as you? Will you load a couple more rounds into your shotgun and fight your way past the strange, winged creatures before you? 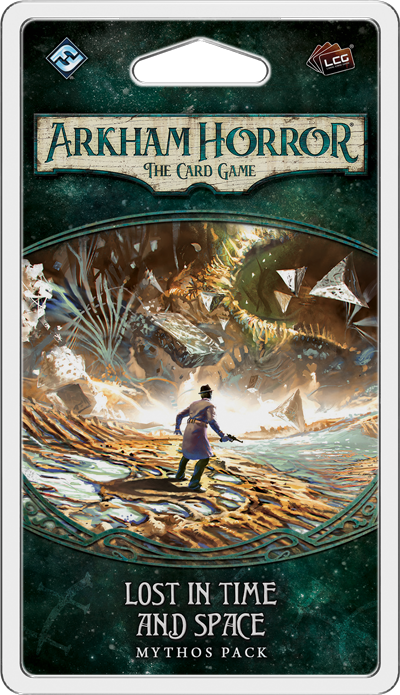 Will you open your minds to the darkest possibilities of all the Spells you've learned—possibly even consulting the forbidden pages of the Necronomicon? However you proceed, you're likely to find this one of the strangest and most difficult journeys anyone could possibly imagine. Share your experiences through The Dunwich Legacy with the other members of our community forums. Then mark your calendars, because in our reality, Lost in Time and Space (AHC08) arrives at retailers next Thursday!